We have THE BEST selection of Kits for all needs and wants. Whether you are new to cheese, yogurt, Kefir or Kombucha making, you may be surprised or challenged by the various supplies needed. Don't feel intimidated; The CheeseMaker can help! We offer all of the necessary supplies you need, whether you are a hobbyist or a serious artisan. Whether you are just starting out and need a book on the basics, or are a seasoned cheesemaker who just needs to refresh your cheese cloth reserves, you will find a cornucopia of cheese making supplies you need here. The CheeseMaker is dedicated to providing you with high-quality and reasonably priced cheese making supplies of all kinds. Our products and cheese making tools are of the highest quality, many are custom made with us hobbyists in mind. Looking to get started with cheese making? Look no further; we have everything covered with our comprehensive cheese making kits! Not sure which cheese making kit to purchase for yourself or someone else? There are many choices. Read the descriptions and feel free to call, text (414-745-5483) or email me if you need help. Rather than purchasing all the individual items, and cheese making equipment needed to make artisan cheese, I've taken the guesswork out and assembled Kits to meet your needs. And, there is always a savings when purchasing a Kit. We offer Kombucha SCOBYS, kits, and the highest quality tea from local company Rishi Teas. Making Kombucha is easy, takes very little time and will save you lots of money. You can make a gallon of Kombucha and tweak it for the taste you prefer for less than what a bottle costs in the store. Kombucha is a healthy and delicious alternative to soda and any liquid that contains too much sugar and lacks naturally occurring vitamins and healthy bacteria and yeasts. Kefir is a dairy product that is delicious and rich in probiotics. It offers a variety of health benefits, such as improved immunity, better lactose digestion, detoxification, stronger bone density, and more. Despite this, it can be difficult to find quality Kefir in stores. Many store bought Kefir has added sugars, flavorings, juices and other unnecessary additives. Fortunately, Kefir is simple to make at home, and when you have Kefir making supplies from The Cheese Maker, you can rest assured that you can make the best Kefir available, right in your kitchen. When you want to make Kefir for yourself at home, shop The Cheese Maker for Kefir making supplies today. 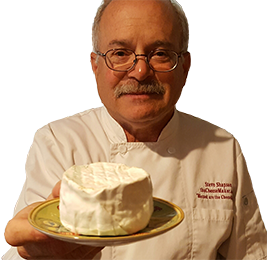 Steve Shapson is The CheeseMaker. Back in 1999 Steve made his first cheese, Camembert and was hooked. Though at that time, there was very little information and books on making this cheese. So Steve plugged ahead and learned the art of making these delicious bloomy rind cheeses. Launching his small company in 2005 with one product, a home cheesemaking kit for Camembert & Brie, it was an instant success. Over the years, with the help and input of his customers, Steve has added many innovative products, many designed and produced by him himself. Steve maintains very high standards, making himself available to his customers for help and serving customers in both the United States and Canada. I have made the following recipes many times, making improvements in the process. You may come up with a slightly different method or ingredients and get a great result. Cheese making is 90% craft and 10% science. Don't be afraid of making small changes when you think it will improve your results. Aside from the current recipes listed on our website, we will be adding many more. We transfer our knowledge of cheese, yogurt, kombucha, & kefir making products to you, the at home artisan, so you can easily make the quality gourmet foods you love.